Newly created podcasts celebrating The Sound of Music’s 50th anniversary are now streaming on masterworksbroadway.com. The three part series features recent interviews with original cast members Theodore Bikel (Capt. von Trapp), Brian Davies (Rolf) and Lauri Peters (Liesl), as well as Ted Chapin (President of the Rodgers & Hammerstein Organization) and Sam von Trapp (grandson of Maria von Trapp). 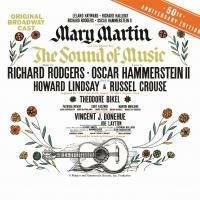 Masterworks Broadway celebrates the 50th anniversary of the original Broadway cast recording of The Sound of Music. On this podcast episode, we talk with the president of the Rodgers and Hammerstein organization Ted Chapin. Masterworks Broadway celebrates the 50th anniversary of the original Broadway cast recording of The Sound of Music. On this podcast episode, we talk with Sam Von Trapp and cast members Lauri Peters and Brian Davies. Masterworks Broadway celebrates the 50th anniversary of the original Broadway cast recording of The Sound of Music. On this podcast episode, we talk with co-star Theodore Bikel.